I have a few of those wire basket planters that came with coconut liners when I bought them, and I love them. The coco liner always looks so beautiful when freshly planted with summer annuals. But after a season or two, they start to look dingy and gray. Plus, the birds like to tear the coco fibre apart to use for building their nests in the spring. The result? Well, it’s not pretty!! I love my wire basket planters, but they are unusable without the coconut liners. I could buy fresh replacement coco liners every spring, but that gets to be very expensive. I couldn’t justify the cost of replacing the expensive coconut liners, so my favorite wire planter ended up sitting in the garage. Every time I looked at it I felt sad and frustrated about the cost of the coco planter liners. It finally came to the point where I was either going to get rid of the planter, or figure out how I could make it useable again. All I needed to do was figure out a way to replace the coconut planter liners, but using a cheaper alternative material. I racked my brain for a few weeks trying to come up with ideas. But the answer didn’t come easily, and I continued to feel frustrated. Then one day while I was cleaning the garage, I came across a bunch of leftover landscaping fabric that was just collecting dust. I found my solution for a cheap alternative to coconut liners. When I came up with this idea, I was so excited!! Not only would this be much cheaper than buying brand new coco basket liners, it will also last much longer! And boy was I right about that!! I came up with this idea 7 years ago, and my DIY alternative planter liners look just as great today as they did when I first made them. Lining planters with landscaping fabric is not only cheaper, but it will last for many, many more years than the coco basket liners. And my wire basket planters or much less maintenance now since the liners don’t have to be replaced all the time. Since the landscaping fabric isn’t stiff like coconut liners are, it took a bit more work to get the liner looking good in the baskets of my metal planter. I decided to use a thin metal wire to attach the landscaping fabric to the metal planter baskets. That way, the fabric stays in place and the dirt won’t spill out. I simply poked the metal wire through the liner, and then wrapped the metal around the top of the basket, filling the liner with dirt as I worked my way around the basket. I also took the time to bunch and straighten the liner as I went around each basket so the landscaping fabric wouldn’t bunch up in one spot in the basket. Once the fabric was attached all the way around the wire basket, I trimmed off the extra fabric around the top so it was even with the top of the metal basket. After the baskets were filled with dirt, the liner popped into shape and my wire planter looked great again. The landscaping fabric will last much longer than a coconut liner, saving me tons of money each spring. 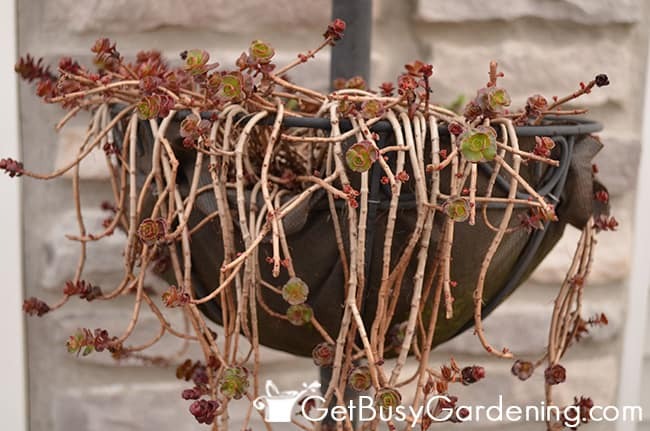 To save myself even more cash, I decided to plant a mix of hardy succulent sedums in my new wire planter rather than using annual plants that need to be replaced every spring. That way, I can just overwinter the hardy succulents in the garage and pull my planter out each spring to reuse year after year. It doesn’t get any easier than that. This option didn’t cost me a cent since I used materials I already had sitting around and plants from the garden. I am very happy with the way this turned out using my homemade coconut liner alternative, and proud of the fact that I was able to make my wire basket planter new again. If you’re not ready to take on a project like this yourself, you can purchase a coconut liner roll and cut them to size, or buy replacement coco liners here. 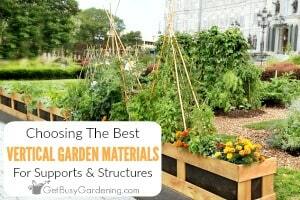 This would work great as an alternative for any type of coco liner baskets, including hanging baskets with liners, hanging deck railing planters, or replacing coco liners for window boxes. 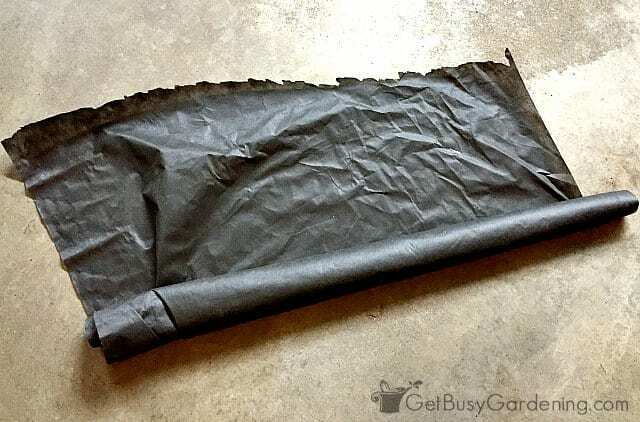 Even if you don’t have any sitting around in your garage and you have to buy landscaping fabric to replace your coconut liners, it will still be cheaper in the long run because the landscaping fabric will last much, much longer than the coconut liners. If you prefer the look of the coconut liners over the landscaping fabric, another great alternative wire basket liner is burlap. A burlap liner will give you a similar look as the coco liners, but will last longer. You can buy burlap in a roll, and follow my instructions above to line your wire basket with burlap liner. 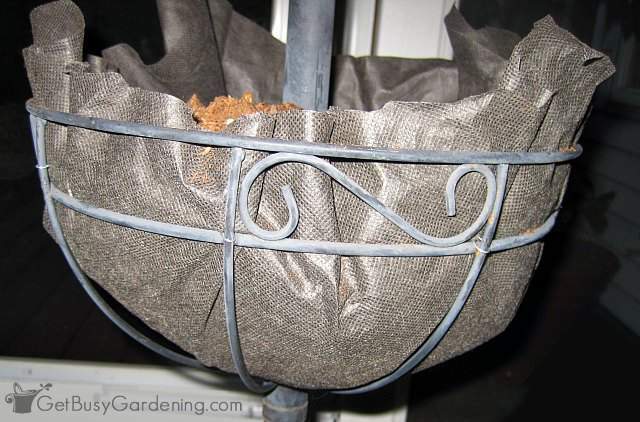 So, if you have any hanging baskets or wire baskets with liners sitting around collecting dust, give them new life with with these do-it-yourself wire basket liners! Have you figured out a cheap alternative to coconut liners too? Tell me about it in the comments below. Great idea! I've got a few of those metal planters that I couldn't find the perfect liners, so they're stuck in the garage. I will try this idea, thanks! Yeah, I'm glad to hear you're going to try the landscaping fabric in place of the coconut replacement liners. Hopefully it will work for you too. Have fun! That's a good idea! You did a nice job, too. It looks great. I used burlap a d it worked great! And burlap is made from a natural resource, jute or sisal. There *are* organic landscape fabrics, but most are usually formed of polypropylene. I did the same thing except I left fabric hanging over sides then used a rubber band tucked the extra fabric under rubber band then pulled extra fabric back up over inside of pot and buried fabric with potting soil. This gives it a nice finished edge all around the pots. Cool, thanks for sharing! Great idea. Yes, the landscaping fabric liners are holding up great! Plus the plants have survived two years in the garage overwinter, so the planter has filled in really well. I was going to take a picture the other day and post it, but I totally forgot. Thanks for the reminder, I will try to do that this week. If you end up doing this, I would love to see pictures. Thanks for sharing this great idea. I purchased two large wire planters at a salvage store. They were cheap but buying new liners would be very expensive because of their size. I’ve got some landscape cloth in the potting shed so I’m going to try this and see what happens. 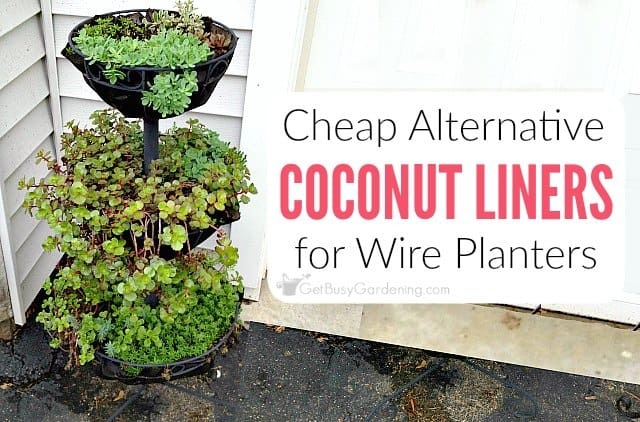 Isn’t it funny how the coconut liners can be more expensive to buy than a new wire basket planter sometimes? Sad! That’s probably why they planters were at the thrift store in the first place! Hope it works out well for you. Burlap is also a good alternative! Yes, burlap is a great alternative to coconut liners too! Good idea, although I’m just wondering if burlap might rot? Yes, the burlap will rot over time, but would last a little longer than the coconut liners. The landscaping fabric will last much, much longer than burlap. So then using burlap should give you at least a year’s worth of use? I am trying to decide which burlap to buy. There are so many options. Any advice? I see 10oz and 7oz. I’m guessing the 10oz will be better as it’s heavier and therefore more durable? As long as the birds don’t rip it apart like they do with coconut liners, then burlap should last longer, LOL! Yes, I would recommend getting the thicker burlap. What exactly is landscape fabric? 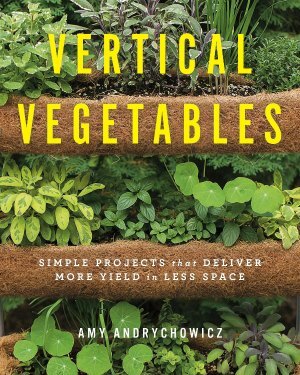 Are you talking about the weed barrier that is usually under the soil in yards? We have a really good home depot where I live but need some clarity on what the fabric is or if I go and ask for that will they know what I am talking about? Yes, the fabric weed barrier. Get the thick kind, not super thin stuff. Thanks so much, I’m glad you like it! I’m going to have to try this, Amy. Great idea! I think I need to splurge next spring for new baskets, though, or I might opt to spray paint them. Your blog is looking great! I would totally try spray painting them first, I bet that would give the new life!! Thanks Beth, I’m glad you like the new site!! I actually purchased some hanging wire baskets for the first time at a goodwill store and applied spray paint on them (I didn’t like the original color). So, yes, spray paint the baskets — I spray paint everything! What I don’t understand is how come everyone is using the liners instead of flower pots. I didn’t know ppl placed the liners in the wired basket. I purchased cheap, colorful flower pots (different sizes) and they look great in the wired baskets. I’m sure the plastic will last a lifetime! 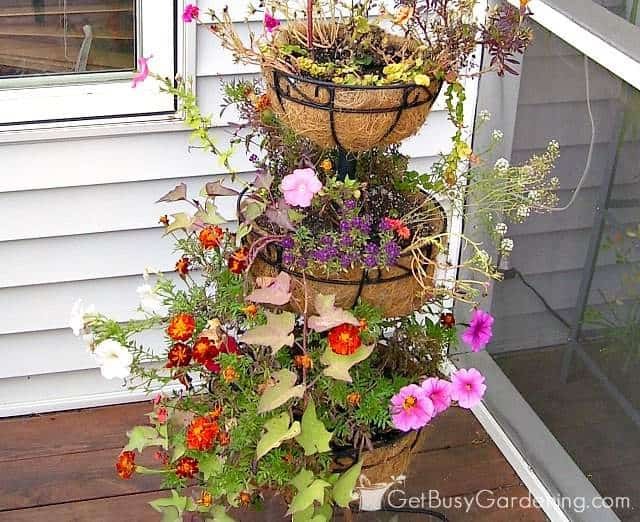 Using flower pots in wire baskets instead of liners is definitely an option. I had an old, upholstered footstool on the covered patio. I had intended to re-cover it when we got a puppy. He chewed into the fabric and exposed the old fashioned filling which was finely shredded natural fibers, possibly what was called cellulose in years past. It looked just like the coconut liners but was not formed. I emptied the stool of all the filler, set it out in the rain to remove any dust that I didn’t want to breath, and filled my wire containers with it. It worked great! Wow, that is very clever of you Patty! Great job on the repurposing! Thank you for the great alternative to coco liners. 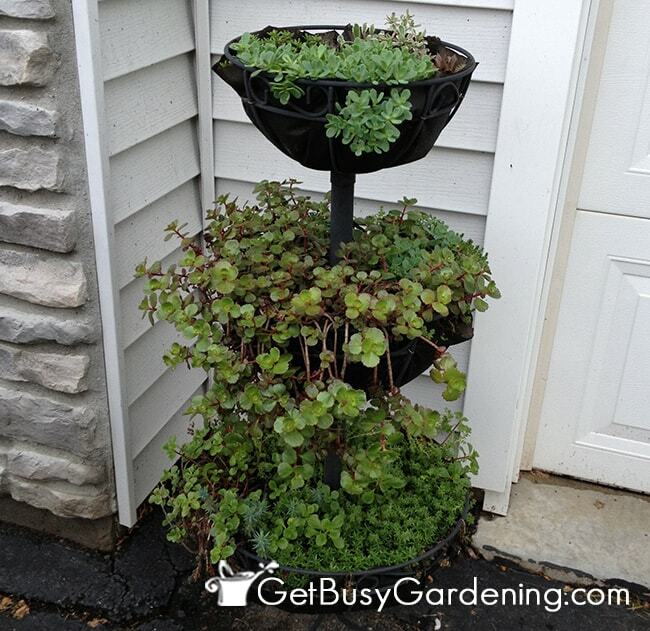 I have a beautiful, 3 tier, verdigis corner planter that I have been unable to use for three years because the containers that came with it descinigrated over time. Great idea. Thanks again. You’re so welcome! 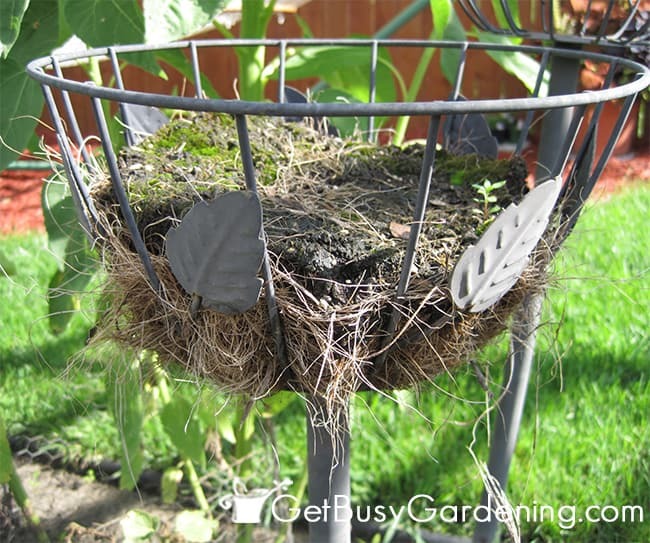 Glad to hear you’ll be able to reuse your beautiful wire basket planter again! Thanks for the tip! I’ve been replacing my coconut liners until now, but I’ll try the fabric alternative. Another tip- I grow strawberry plants in some of my hanging baskets. They’re perennial, so you don’t have to do anything to them in the Spring (except possibly replace the liner, and take away the dead stems). They come up again like magic every Spring. Great! Thanks for your tip too! I love strawberries! Mine are just beginning to flower now, so hopefully there should be a good crop of strawberries this year. They’re pretty easy to grow, and when they produce runners, you can stick these back into the soil & they become new plants. They just need a bit of liquid plant food every week or so to maximize fruit production. Wonderful, I love it! It sounds beautiful. Great idea. My idea is to use burlap coffee bags as the liner, that I get free at a local commercial distributor. I also use these for ground cover to keep weeds at bay. It works great, I layer them for better coverage in my garden rows. Keep up the good work! Sounds like a great option for sure! I bet they look lovely. I love the idea of using the burlap bags as a weed barrier, you’re lucky to a source for such and wonderful resource like this. My mom always said two heads are better than one. That works for great ideas as well. I used both the burlap and the landscaping fabric. I lined my planters first with the burlap and used the landscaping fabric inside of the burlap. Zip ties were used to secure both the burlap and fabric. It was a very simple and easy process. I couldn’t be happier with how it turned out. 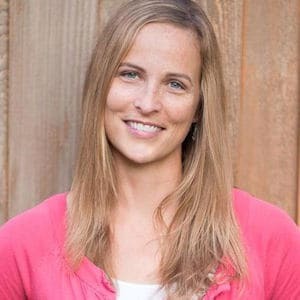 A tip to stretch your potting soil is to add a layer of mulch first then add potting soil and finally top off with mulch to help plants retain water and prevent drying out. Sounds like a great solution, thanks for sharing! 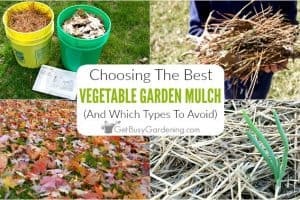 And a great tip about the mulch too! Awesome. I am so glad I found your post. Birds have been wreaking havoc on my hanging wire baskets I have lined with the coco liners. After reading your post, I was pulled out the coco liners, flowers and all and lined my baskets with landscape fabric. I then placed the coco liners on top of the fabric and cut off the excess fabric. No more birds tearing away at the liners. I have to say, the fabric made the baskets look better. Great, I’m so glad to hear that this was the solution you were looking for! The fabric will last much longer than the coco liners too. I’ve been using coco liners for years and have had a variety of problems with them. 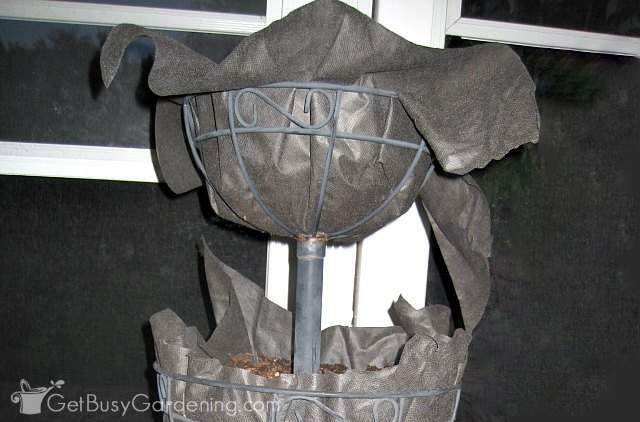 I’m going to try the landscape fabric with my wire hanging baskets. Does it help retain moisture? I’ve read other blogs suggesting plastic garbage sacks, cut to fit, over coco liners to help with the need to water everyday. Would the plastic liners help with the landscape liners too, or are the landscape liners sufficient? No, the landscaping fabric does not help retain moisture. Lining them with plastic is a great idea… just make sure there are drainage holes in the plastic. I use plastic grocery store bags to line my planeters. Poke holes in the bottom for drainage, then i use a diaper, fill with soul, trim plastic, tuck excess into dirt, then plant. The liner keeps the coco or burlap clean and prevents early rotting. Thanks for the great ideas. I like the idea of the burlap and then the landscape liner. Burlap comes in such great colors and even prints. I wonder if paper bags would work to make it look more like the coconut. Also you can put a diaper before you put the soil in to hold the moisture. Oh, a printed burlap would be super cute!! I have heard that you can put diapers in the bottom to hold moisture, but I haven’t tried that myself. I wouldn’t use them for growing food though. You can buy the same gel in a lot of places, it is non toxic, and won’t hurt food plants. I buy it at Dollar tree, it’s the same gel medium that you can use in flower vases. No use wasting a diaper. The funny thing is, this year the price of coconut liners has really fallen, and they’re selling 12″ molded ones in my local supermarket for £1 each (about $1.42)! I wonder if it’s still cheaper to use alternatives? 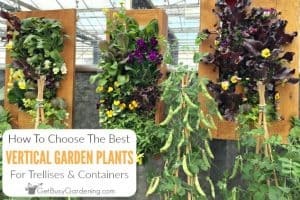 It would depend on how any containers you have. I guess you’d have to price it out. The landscaping fabric definitely lasts longer, so I’m guessing it would be cheaper over the long-term. I have used landscape fabric inside my coconut liners for years. The coconut liners today are so thin they usually allow soil to leak out along with the excess water, making a mess. The landscape fabric prevents this. This retains moisture much better than just the coconut fiber. Otherwise the wind will quickly evaporate the moisture from the plant. This also protects the coconut fiber from the soil and they last much longer. I can get 4 seasons or more from a coconut liner. brilliant! i was about to order some coconut liners wich im sooooooooo tired of replacing every 2 years .. i have a bunch of landscaping material, thank u thank u!!! !Im so happy i ll save some money haha .. you are very creative!! I’m wondering whether the fabric Eco bags, that we all seem to end up with so many of or calico might work? You can click on this link to sign up for my newsletter. I, also, was just getting ready to order some new liners for window boxes on my potting shed and other various hanging plants!! Somehow found my way to your post and am excited about trying some of the suggestions!! Also, to you who have wire baskets, DO NOTget rid of them!! I’ve been spray painting them for years and they last forever!! If they get a little rusty, just sand it of with a wire brush or steel wool or sandpaper. You can change the color anytime you want!! 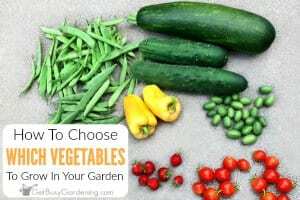 We gardeners have to stick together to save all the money we can!! Awesome, hope it works great for you! 🙂 Thanks so much for your tip about painting the wire baskets. I have done the same with some free ones I’ve found at garage sales. So much fun! Love the landscape fabric with burlap! Thank you for the great ideas. I’ve been looking for something to use inside of a metal basket I have since I can’t find any liners in my area. I will definitely be trying the burlap with the landscape fabric. So glad I’ve stumbled upon your site and began reading all of the comments. I had went online to search and possibly purchase one 24″ and two 36″ coconut basket fillers for planters that I found at a flea market and brought home today. I had no idea they replacements were so pricey! No way was I paying those prices when I recently found a 12 inch round one at DG for $2. Again, thanks for the tips!! I am about to try using leftover screen to do mine. We have a big roll out in the barn and I think it’ll provide both drainage and support. I’ll update whether it works or not. Really excited to find this site. I plan to place the landscape fabric or burlap in each of the ten nests of hanging old chicken nest container on the outside wall of the old chicken coop. Great info! I was just out earlier today looking for liners! I will get some weed liner. Thanks so much! How do you think that would work in inside decorative pots? I’m always frustrated that I have a nice decorative pot with no drain hole and nothing fits inside. I could drill a hole but then I need something under the pot to catch water. anyone have ideas? Maybe the burlap with some rocks or packing peanuts under? The only way you can add adequate drainage to pots and containers is to drill holes in the bottom. Filling the bottom of the pot with packing peanuts or any other material will not provide drainage. If you’re growing the plants outdoors, then adding drainage holes is really your only option. 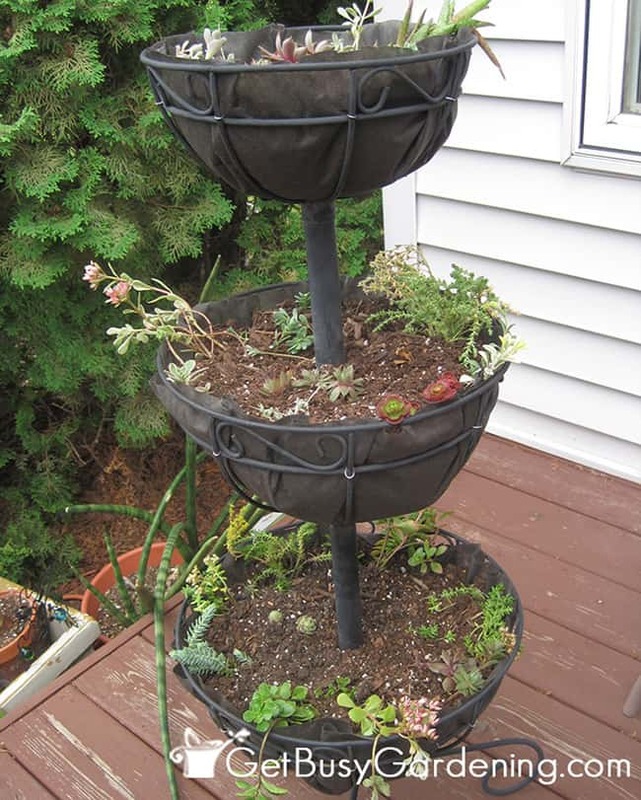 I have three 24″ Georgian trough planters with no liners. Since the planters will be attached to a porch rail and planted with trailing plants, I was thinking of using newspapers to line the baskets. Do you think this will work? I was fortunate to buy these beautiful planters for $15 (all 3 of them!) and can’t afford a fortune on coco fiber liners. Thank you for your feedback. Just had a thought after reading some comments here. I poke holes in my coconut liners for side planting. Using the burlap and landscape liner as well might make this more substantial and stronger. Any other suggestions would be appreciated. That sounds like a really cute idea for your planters. when i use zip ties or wire to tie onto baskets, etc. i go to dollar tree and get the rolls of thin rope that is in crafts or by the duct tape is where ours is located and i tie little bows over each zip tie. Time consuming ,but cute. That sounds super cute, thanks for sharing that tip about dressing up your wire baskets! Thank you, thank you, thank you! I have quite a few planters with coconut fiber that need to be replaced, but I really didn’t want to continue replacing them at $13 each. I just happen to have landscaping fabric in my garage, so I’m headed off to do them now. I line my wire baskets with moss collected in the forest when my husband and I go for a walk. You can then place your bird-torn coconut liner in it or now use this great idea of the landscape fabric! Moss can also be added over the dirt and around new plants as they grow to keep the moisture more consistent. It can be left on or removed after the plants fill in. Thanks for the landscape fabric idea – love it! You’re welcome! And thanks for your tip about the moss. It’s funny, because moss has naturally started growing on the outside of one of my liners, and I was just thinking that I wish it would grow over the whole thing. That would be beautiful! What a fantastic idea! I was just telling my husband that I wasn’t going to do my hanging planters or stands this year because they all needed the coconut liners replaced.😞 I was looking at around 100.00 + yikes! That’s just crazy. Well I’m so glad I didn’t miss this because I have a 50′ roll that I had no idea what to do with woohoo I do now! 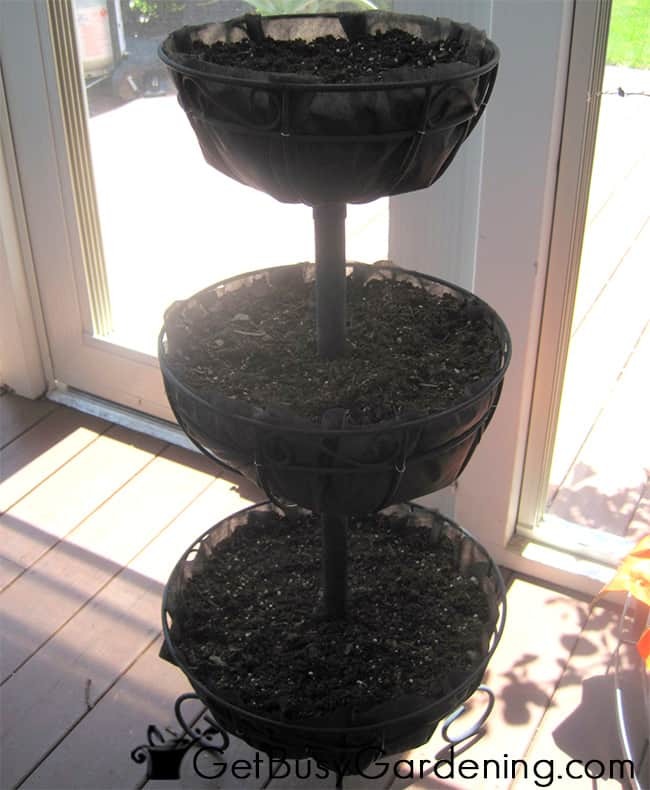 Thanks again for such an awesome idea it’s going to be 95+ here for the next 3days so this will be the perfect project for my indoor potting station. 🙂 Have a super weekend! Yeah! So glad to hear that you will be able to use your wire hanging baskets and planters after all! The coconut liners are pretty, but so darn expensive. Have fun and I hope the landscaping fabric alternative works great for you! WONDERFUL!!! After stops at 5 different garden centres, and still nothing to fit what I need, my wife mentioned some burlap in her fabric pile. I’m gonna give them both a shot. Have the flowers, more baskets than I can think of, all because I can’t find the liners. Great blog by the way. Flowers here I come. Oh and for those that notice, “centre is spelled correctly” I’m Canadian lol. Great ideas! Now I’m thinking I could buy remnant fabrics, or use old T-shirts instead = reuse / upcycle too. I laughed at the comment [above] about how the liners are sometimes more expensive than the baskets.